In her own words, comedienne Gilda Radner reflects on her life and career. LOVE, GILDA opens up a unique window into the honest and whimsical world of a beloved performer whose greatest role was sharing her story. LOVE, GILDA, directed by Lisa D’Apolito, is a true autobiography, told in Gilda’s words and in her own voice. Working with the Radner Estate, D’Apolito unearthed a collection of diaries and personal audio and videotapes documenting her childhood, her comedy career, her relationships and ultimately, her struggle with cancer. This never-before-seen footage and journal entries form the narrative spine of the documentary, allowing Gilda to tell her own story-- through the laughter and sometimes the tears. Incredibly, she was able to find humor in even the darkest of times. 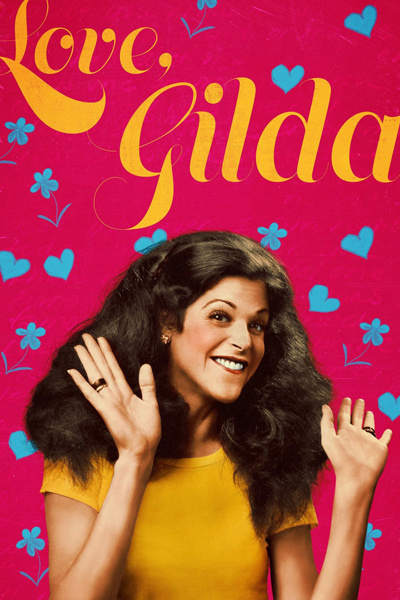 Gilda’s spirit lives on in comedy as a female trailblazer who continues to inspire many present day comedic performers, including Bill Hader, Amy Poehler, Maya Rudolph, and Cecily Strong. Also interviewed are SNL original cast members-- Chevy Chase, Laraine Newman and Paul Shaffer-- as well as, Lorne Michaels and long-time friend Martin Short. LOVE, GILDA opens up a unique window into the honest and whimsical world of a beloved performer whose greatest role was sharing her story.